"We live in the present, we dream of the future, but we learn from the past." Mayling Soong, who became Madame Chiang Kai-Shek, is the Wellesley College Person of the Week. One of the most influential women of the twentieth century, Mayling Soong was born in March, 1897, in Shanghai. Her father Yaoju "Charlie" Soong, was a Methodist minister and businessman, who spent some 15 years during the latter part of the 19th century in the United States, where he earned a certificate in theology at Vanderbilt University in Nashville, TN. Her mother, Kwei Twang Nyi, was a devout Christian and strict disciplinarian. The fourth of six children, Soong came to the United States in 1908, living near the campus of the Wesleyan College for Women, in Macon, GA, where her sister was a student. She was tutored by Wesleyan students, and attended school in Demorest, GA. She was an excellent student, who picked up English, which she spoke with a Georgia accent, quickly. 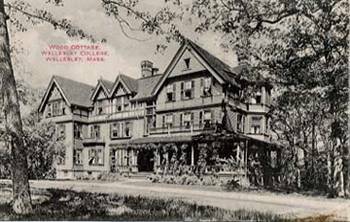 In 1913, Mayling entered Wellesley College, where she majored in English Literature and minored in philosophy. In her senior year, she was named a Durant Scholar, Wellesley's highest academic distinction. She was a member of the Tau Zeta Epsilon society and was a casual tennis player and swimmer during her Wellesley years. She boarded with a Wellesley family her first year, and lived in the Wood Cottage and Tower Court, on campus, from her sophomore year through her senior year. She was outgoing and popular, and according to a friend, "There always seemed to be some nice Chinese boy or other on the doorstep of Wood." Following her graduation from Wellesley College in 1917, she returned to China, where she honed her fluency in spoken Chinese, and studied the classics and literature of China. She did social work for the Y.W.C.A. in Shanghai and was appointed to be a member of Shanghai's Child Labor Commission. 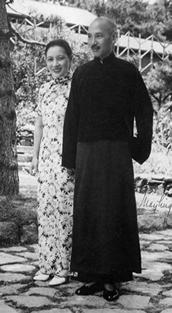 Mayling met Chiang Kai-shek in 1920. He was eleven years her elder, and a Buddhist. Although he was already married, Chiang proposed marriage to Mayling, much to the objection of Mayling's mother. He eventually won Mrs. Soong's blessing for marriage to her daughter by providing proof of his divorce, and after committing to convert to Christianity. He told his future mother-in-law that he couldn't convert immediately, because religion needed to be gradually absorbed, not swallowed like a pill. He was baptised in 1929. A rising star in the Chinese military, he became Generalissimo Chiang Kai-shek, the leader of the Nationalist Party, and engaged in a struggle with communist factions which would continue for the rest of his life. Madame Chiang initiated China's New Life Movement in 1934, with the goal of the "physical, eduacational and moral rebirth of the Chinese nation", based on traditional Chinese values. In 1936, she assumed the role of Secretary General of the Chinese Commission on Aeronautical Affairs. She said, " Of all of the inventions that have helped to unify China, perhaps the airplane is the most outstanding. Its ability to annihilate distance has been in direct proportion to its achievements in assisting to annihilate suspicion and misunderstanding..."
Madame Chiang Kai-shek was her husband's English translator, secretary, advisor and an influential propogandist for the Nationalist cause. She distinguished herself as a skilled negotiator during the "Xi'an Incident". Following the refusal of Nationalist forces in Sian, China, to engage communist forces in December, 1936, Chiang Kai-shek went to Sian, where he was "arrested" by military subordinates. Madame Chiang Kai-shek flew to Sian and successfully negotiated the Generalissimo's release, on Christmas Day. In February, 1943, Madame Chiang became the first Chinese national, and the second woman, to ever address a joint session of the U.S. House and Senate, making the case for strong U.S. support of China in its war with Japan. She came to Wellesley College the next month, her first visit to her alma mater following her graduation in 1917. 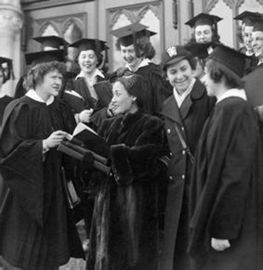 In a nationally broadcast speech, Madame Chiang addressed assembled students and faculty in Alumnae Hall. In 1949, when communist forces gained control of China's major cities, Chiang Kai-shek fled the mainland, and declared Taipei, Taiwan to be the temporary capital of China, where he was elected president. Madame Chiang continued to play a prominent international role. She was the honorary chair of the American Bureau for Medical Aid to China, a Patron of the International Red Cross Committee, honorary chair of the British United Aid to China Fund, and First Honorary Member of the Bill of Rights Commemorative Society. Through the late 1960's she was included among America's 10 most admired women. President Chiang Kai-shek died during his fifth term, in 1975. Following her husband's death, Madame Chiang returned to the U.S., residing in Lattington, NY. Her many published works include This Is Our China (1940), Sian: a coup d'Etat (1941) and The Sure Victory (1955). Among the institutions to grant Madame Chiang honorary degrees are Boston University, Hahnemann Medical College, Loyola University, University of Michigan, and Wellesley College. Madame Chiang Kai-shek passed away on October 23, 2003, at the age of 105.